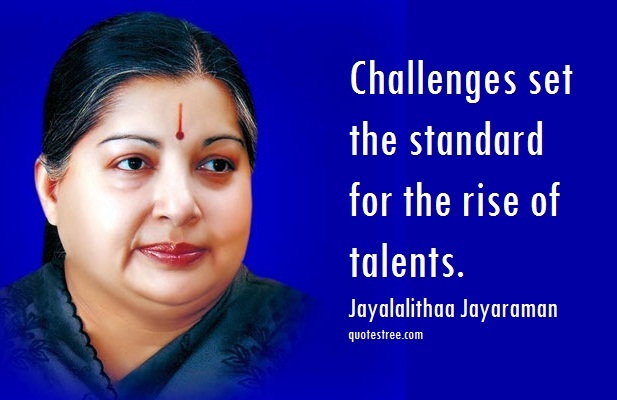 Jayalalithaa Jayaraman was an Indian actor and politicians who served five terms as the Chief Minister of Tamil Nadu. MGR has been a great influence in my life, I don’t deny that. But now I am my own person. I have evolved. Hereafter, I am responsible only for myself. Never again will anybody influence me to such an extent that all my thoughts and actions and statements are influenced and made in a particular way just because someone else wants it that way. It is very strange and saddening to see that when such acts are perpetrated against the minorities, all political leaders rush to issue statements of condemnation. But when persons belonging to the majority are subjected to similar perpetration of heinous crimes, not a single political leader has so far issued a statement condemning this barbaric crime. Such acts of senseless violence should be condemned no matter who is responsible for them and no matter who the victims are. It is not as though a crime is a crime only if it is committed against the minorities and not so if it is committed against the majority community. This should be viewed as a crime committed against humanity...remind all the political leaders in India that it is not only the minorities who enjoy rights under the Constitution. The majority have rights too. For a plan you can find the sides, the good and bad. Just like in every deed, good and bad are two sides of the same coin. It depends on their mind. Cinema should stand as the perfect example to lead people in the right direction. Education can be the answer to your question. But culture is an essential part of being human. Challenges set the standard for the rise of talents. University is the basement for the rise of talents and knowledge based developments. People of Tamilnadu is my children. The welfare of Tamilnadu people is my happiness.